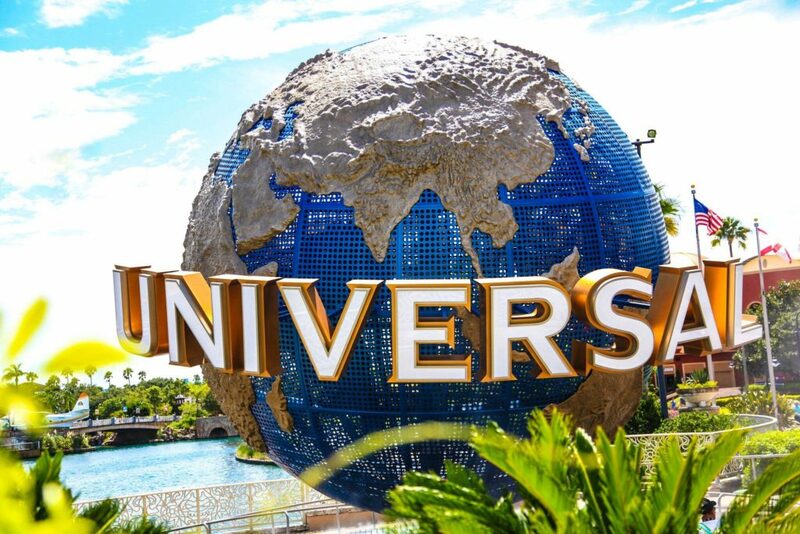 Universal Studios Florida is known as the park in Orlando where the older kids go. 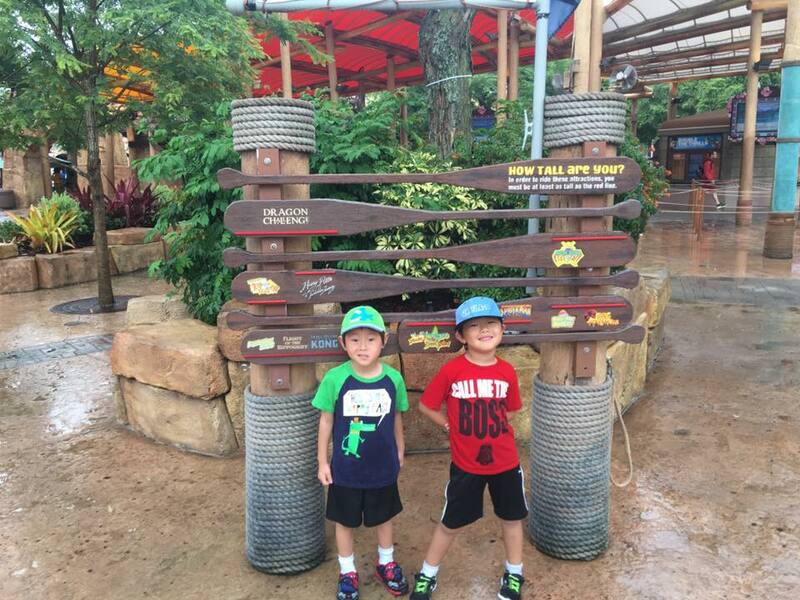 We took our kids to Universal Studios Orlando when they were six and again when they were seven and we no longer think that Universal is the place for older kids or that the Disney Parks are the only option for families with younger kids. As we were planning our first trip I worried our boys were too young to fully enjoy the park. I’ve always thought of Universal as a “big kid’s park,” suited to tweens and above who had outgrown the Disney Parks…or who at least thought they had. I don't think you ever really outgrow Disney but that's not why we're here today. As I was planning our trip to Universal, I kept thinking how my kids were the perfect age for Disney World. I kept wondering if I’d made the right choice in vacations. Spoiler alert: I did. See also we went to Disney World three months later and it was a totally different experience – don't compare. 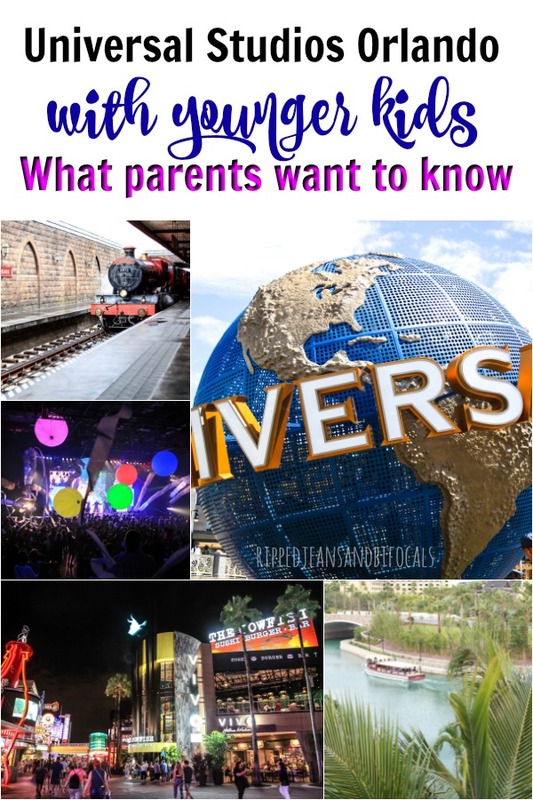 There are so many cool things for families with younger kids to do at Universal Studios Florida. We spent three full days in the parks and left wanting more, which is always the sign of a great vacation. 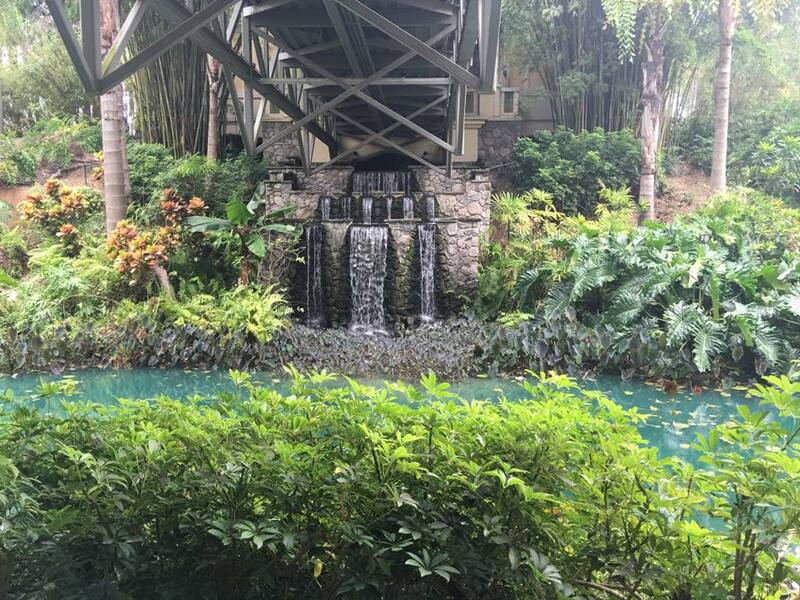 We stayed at Loews Royal Pacific Resort which made it super easy to get to both parks (Universal Studios and Islands of Adventure) and City Walk. 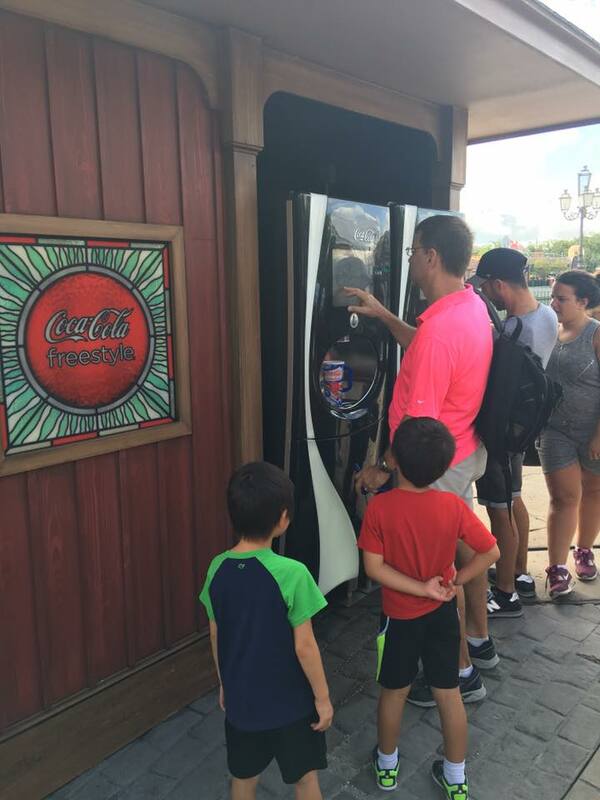 The walk from Loews to Islands of Adventure took us about 10-15 minutes at a slow and leisurely pace – think walking with two six-year-olds who want to stop and look at everything.) The walking paths are super stroller friendly. Does this not look awesome? The resort had all the amenities we could have ever wanted and then some: gift shops, amazing restaurants and a fantastic pool area with a man-made sandy beach. 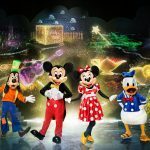 The rooms were a good value and while you can certainly find lodging in the Orlando area for less, absolutely nothing beats the convenience of being close to the parks. Staying on property allowed us to minimize travel time to the parks every day and when you’ve got small humans in tow, being able to just get there without having to answer “when are we going to be there” 60 bazillion times. We didn't have to deal with parking or traffic at the end of a busy day and that makes a huge difference. We have also stayed at Sapphire Falls, which is also very nice. It's considered to be a less deluxe resort that Royal Pacific, although I don't personally see it. The dining at Royal Pacific is a little more high end (translation: expensive) but the pool at Sapphire Falls is fantastic. I found the rooms to be nearly identical in size, amenities, and comfort. The lobby decor is probably a little more luxe at Royal Pacific versus the “modern rustic” vibe Sapphire Falls has. The big difference is that you don't get the automatic fast pass by staying at Sapphire Falls and you do at Royal Pacific. I recommend you do some number crunching to see what makes the most sense…because you do want that fast pass. You can take a water taxi from any of the resorts on property to the parks and you can also take them between the resorts. Why would you want to do that, you ask? Your room key will grant you access to any of the pools at the other resorts on property, which is another reason to stay on property. The Cabana Bay Beach resort has a lazy river. You’re welcome. 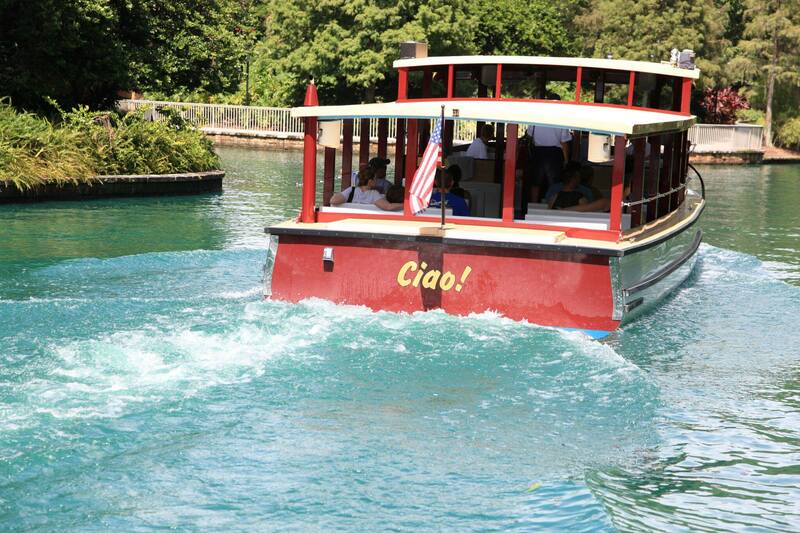 The water taxis are free and they’re really fun for the kids. It’s faster than walking and after the end of a long day in the parks you’re probably ready to take a load off. I was worried that my kids would be too short for most of the rides or find most of the rides to be too scary. Neither was true, although some of the rides are pretty intense, but in a good way. My kids are both over 42” which allowed them to ride most of the rides. If you know how tall your kids are while you’re planning, it helps you build you short list of your must-visit attractions. Measure your kids in the shoes you plan for them to wear in the park if you think they’re going to be close. The entrance to Universal Studios Islands of Adventure has this handy measuring tool where your kids can get an idea of what they’ll be able to ride. 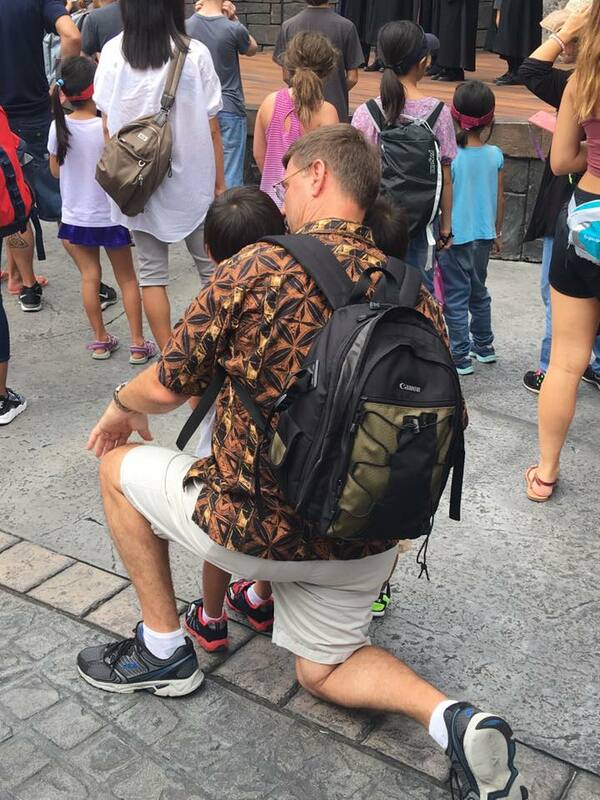 This eliminates any guess work and waiting in line unnecessarily, although do expect your kids to be measured (and sometimes double checked) before they actually get on the rides. I always find it helps to have a general idea of the lay of the land when we go somewhere new. I don’t like to over-plan our days but having a general idea where the attractions we want to visit are located in the parks saves a lot of zigzagging back and forth and aimless wandering. 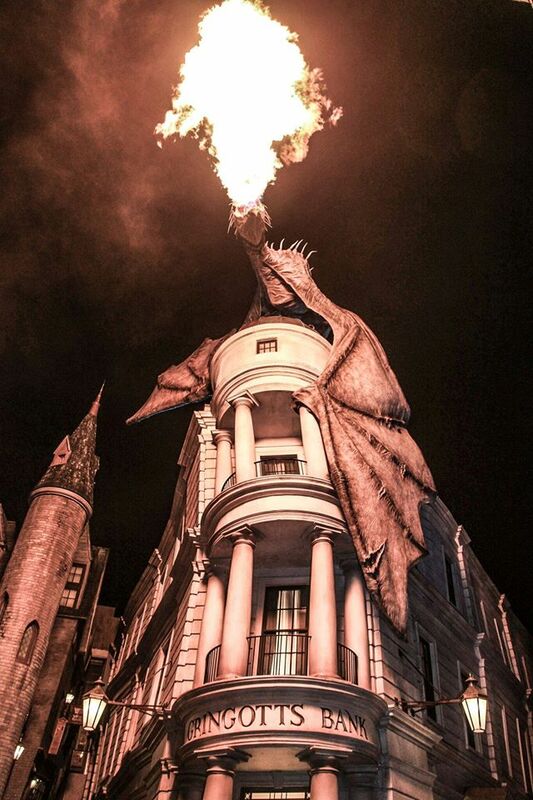 Since there are two parks – Universal Studios, Florida and Universal Studios Island of Adventure – you’ll want to have a plan of attack on how you’ll handle going back and forth. 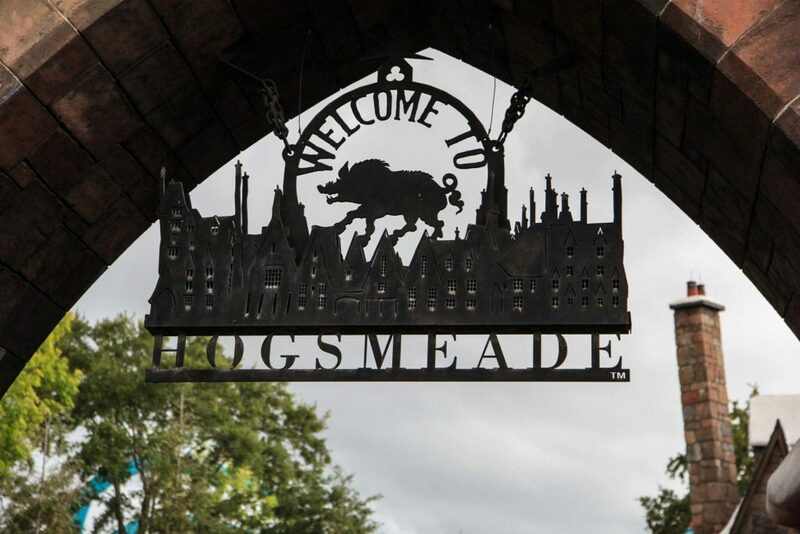 It’s very easy to hop between the two parks but the preferred method of transport is the Hogwarts Express that goes from Hogsmeade Station at Islands of Adventure to Diagon Alley at Universal Studios. The train runs both ways and is only available to patrons who have tickets to both parks. For muggles who can’t apparate, this is the perfect mode of transport. I recommend taking the train from Hogsmeade to Diagon Alley. I found the wait to be shorter, although there is a special feature on the Diagon Alley to Hogsmeade side that allows you to walk through Platform 9 ¾. That might be why the lines are longer! My kids are too old for naps (sigh) but multiple days of going nonstop in the heat wears them down, whether or not they realize it. It definitely wears ME down. Instead of getting to the point where you realize you’re not having fun because you’re tired, schedule in some time to relax. I like to go to the park early and take a break back at the resort during the heat of the day (one more reason to stay on property.) Getting to the park early usually results in shorter lines, so we tried to knock out the rides we knew would have longer waits early in the day – such as Escape from Gringotts in Diagon Alley. 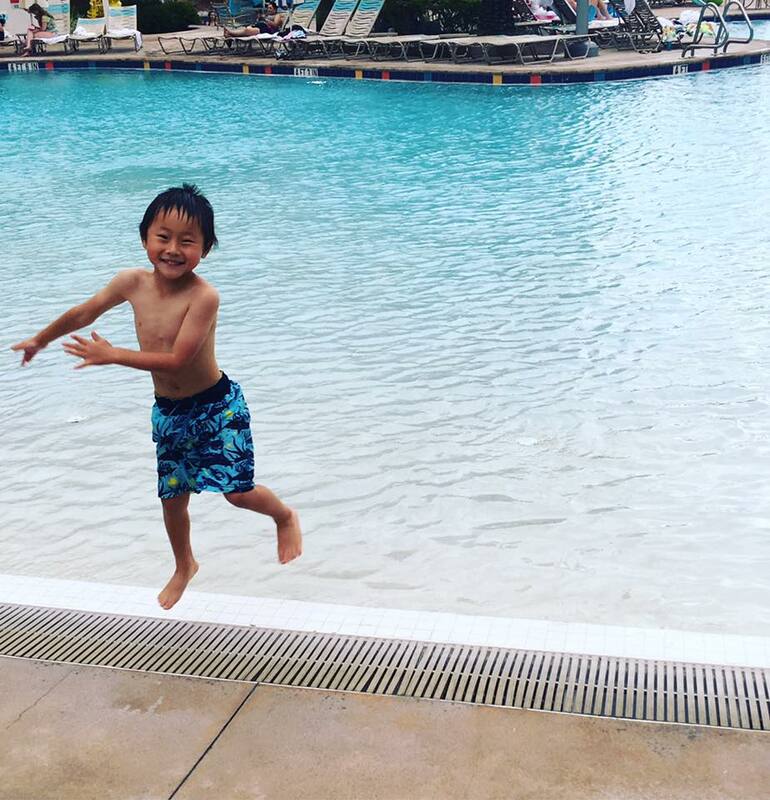 Your break back at the resort could include swimming at the pool or just chillaxing in the room. This allowed us to recharge and go back to the park for round two in the late afternoon/evening. We didn’t carry around a whole bunch of stuff with us but we were mindful about what we chose to carry into the park with us. Between my husband and I, we carried a backpack and a cross-body purse (I carried the purse – ha!) We took our DSLR camera into the park for one day and after that, we decided our phones were good enough for picture taking. We carried plastic bags to contain our phones on the water rides, a stick of sun screen, lip balm, rain ponchos (because Central Florida) and that was pretty much it! The space in the backpack was primarily for stuff we bought in the park. One advantage to staying on property is that you can charge things to your room, which was super convenient. I do recommend carrying rain ponchos in your day pack. Central Florida experiences frequent showers but they usually blow over fairly quickly. Unless there's electrical activity, many of the rides keep going in the rain. Don't leave if you can help it. At the first sign of showers, you'll see a mass egress of park goers. Let them go. Less wait time for you. Throw your poncho on and keep on partying. There are lots of places to eat, both in the parks and at City Walk. We made sure to fuel up at breakfast but for the most part, we planned where and when we’d have our other meals. How often is a wanted poster of Sirius Black on the wall at the place where you eat lunch? Being the huge Harry Potter geeks that we are, we ate at both Three Broomsticks in Hogsmeade and the Leaky Cauldron in Diagon Alley. Both places serve traditional British pub grub and even though the lines were long, the service was really fast and efficient. The food was really good and you absolutely cannot beat the atmosphere. We bought a refillable Freestyle cup in the park for about $22 (good for two days.) There were self-service kiosks where we could refill our cups as often as we needed to (you're limited to once every 10 minutes but OMG who really drinks that much?) There were a variety of drinks available and the lines were never an issue. If you stay at Loews Royal Pacific, Loews Portifino Bay or the Hard Rock Hotel, Express Passes to the parks are included free of charge. If you’re not picking up what I’m throwing down, you need to stay on property. It’s so worth it!!! The Express Pass is essentially a jump the line pass and it saves so much time. You can use Express Passes on all but a couple of the rides. No one likes standing in long lines but standing in long lines with small humans is about as fun as getting a root canal. We didn’t wait more than 30 minutes for any ride and this was during the crazy busy Labor Day weekend. The wait for the thrill rides and newer rides was more but our fast pass allowed us to walk on most of the rides. There was a kiosk in the hotel lobby that allowed us to set our express passes up right after we checked in – easy peasy. Our kids were very familiar with the Minions (because of course) and fairly familiar with most of the Marvel super heroes but they were less familiar with Harry Potter and the Transformers. 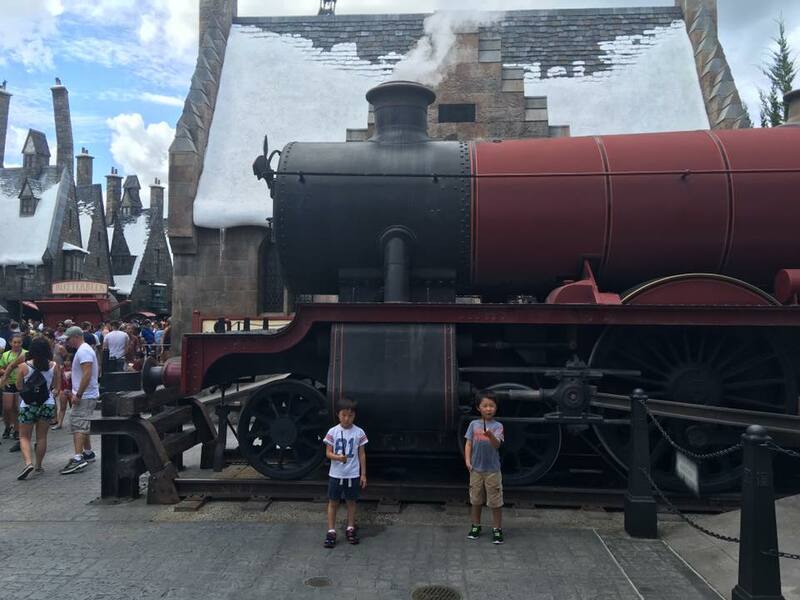 We decided to let our kids watch the Harry Potter movies before we left and it made the Wizarding World of Harry Potter (Diagon Alley at Universal Studios and Hogsmeade at Islands of Adventure) so much more magical for them. 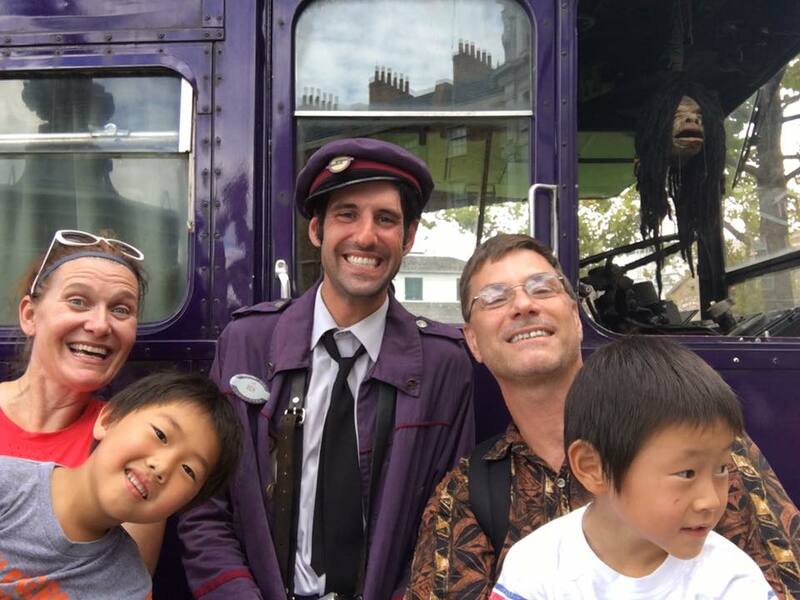 My kids knew exactly who this guy was – Stan from the Knight Bus, of course! I realize this is a personal choice – the Harry Potter movies, especially the later ones are pretty intense for younger kids but knowing what Hogwarts and Quidditch were and having some familiarity with the characters made things so much more fun. 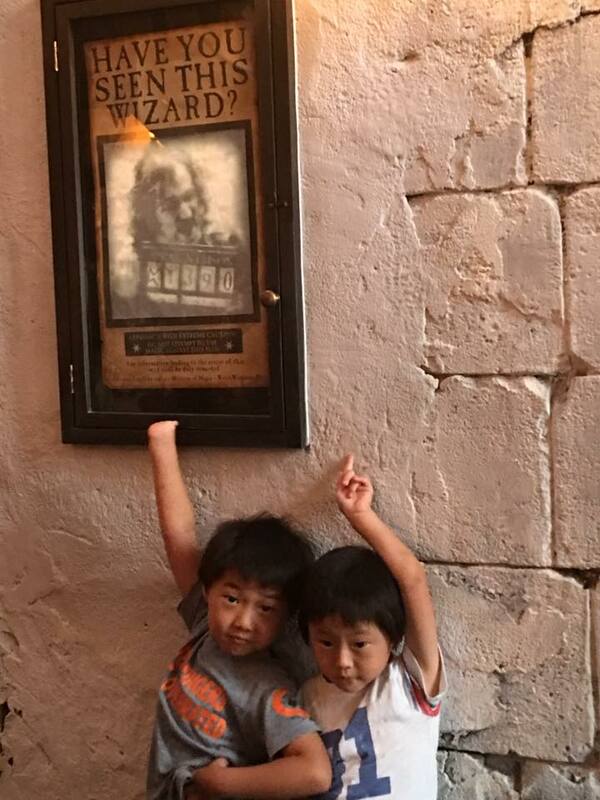 Besides, there’s just something super adorable about little kids when they say wingardium leviosa. Shows are a great way to get a little bit of rest or get out of the rain – again, think Central Florida. Expect rain at some point during your stay but don't let it put a damper (see what I did there) on your plans. We saw Animal Actors on Location, the Eighth Voyage of Sinbad Stunt Show, Posideon’s Fury, Horror Makeup Show and the Blue Man Group. 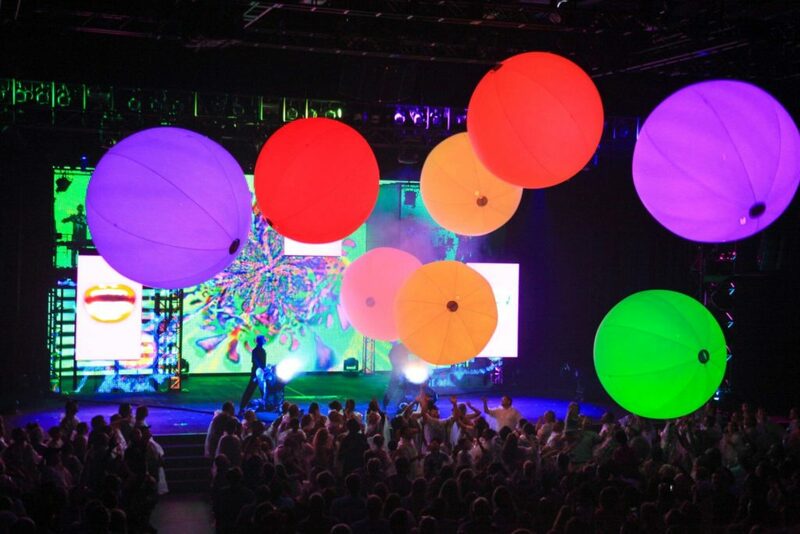 The Blue Man Group tickets need to be purchased separately but if you get a chance to see them, do it. The Blue Man Group is something people of all ages will love. The Animal Actors was really cool and gave some insight into how animals are used in movies and what goes into training them. One of my kids got selected to go up on the stage and be a part of the show. He’s my “timid around animals kid” and I almost pulled him back when I realized the lady on stage was beckoning him down but he did great. Also, if I’d have a do-over on Poisioden’s Fury, I probably wouldn’t have taken my six-year-olds. It was a cool show with lots of pyrotechnics but there was a lot of darkness and talk of “we’re going to die in here” and that wasn’t a great experience for our little guys. The Horror Makeup Show is really fun and slapstick but it does feature some really gory looking makeup and costume masks. Although this isn't presented in a scary way, if your kids have trouble distinguishing being real and pretend, you might consider skipping. If you’ve got people in your group that are too small (or otherwise unwilling) to go on a ride, Universal Studios provides a waiting area and allows riders to switch off without waiting in line again. If mom and dad are thrill ride junkies but the kids aren’t there yet, this works out perfectly. My husband and I took advantage of this so we could ride Harry Potter and the Forbidden Journey and it was the absolute best. ride. ever. I felt like I was flying through a Quidditch match and it was pure awesome sauce. Neither of our kids were tall enough to ride this during our first visit to Universal Studios Orlando so I was super happy that ride swap was an option. Here’s a rundown of what we rode and loved. I wish our vacation could have been longer. We didn’t get a chance to do everything we wanted to do and I actually cried a little the day we had to leave. And that, my friends, is a sign of a truly awesome vacation. This is an electronic “shoot 'em up” kind of ride where each person in the spinning car gets to shoot at aliens. If you like Toy Story Mania at Disney's Hollywood Studios, this is a good one for you. Note – this isn’t actually a ride but a 4-D show…although the seats bounce you around quite a bit! This is an awesome 3-D ride and while the ride isn’t scary, some of the language in the cartoon lead-in is a probably a little intense for younger kids. The idea is that you’re going on a rickety ride in Krusty’s theme park (AKA a nuclear reactor) with Sideshow Bob in the loose. Also, my kids know who the Simpson's are now but they didn't at the time of their first visit at age six. There's quite a bit of Springfield inside Universal Studios that we all enjoyed (don't forget your Lard's Lad donut) but we decided advanced character education wasn't necessary. If you're a fan of spinny rides, this one's for you. Even if you're not (like me) this one isn't terrible but if you're prone to motion sickness and, well…hurling…you might want to avoid this one. This is a tame but not lame roller coaster that is very kid-friendly. You have to be 36″ to ride. If you have younger kids, they may not have watched the movie ET but they'll still love this ride. My kids’ top pick…I'll admit, I only have a certain tolerance for Minions and even I like this one. 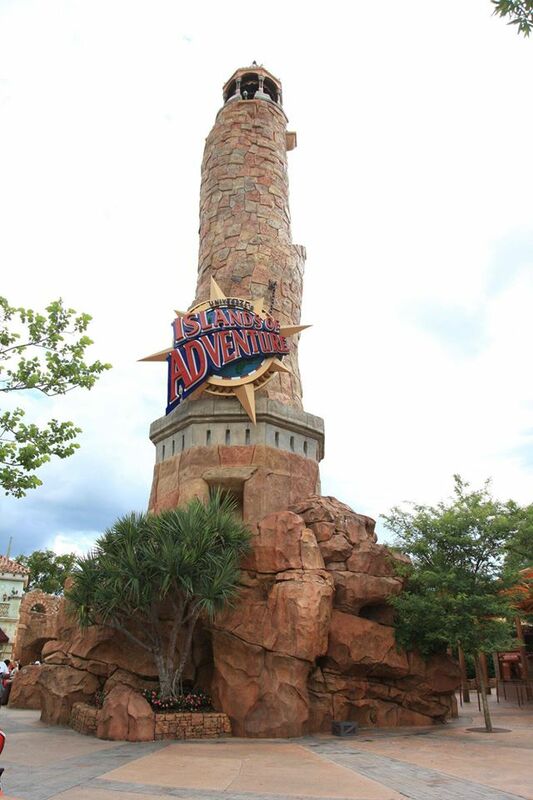 This was the only ride in Islands of Adventure that my kids really didn’t like. There were some amazing dinosaur versus Kong special effects but I guess it was a little too realistic. I loved it, though, so I'm including it as a favorite. This is almost the exact same ride as the Transformers Ride in Universal Studio. All of the Doctor Seuss attractions are awesome. It’s really like being inside the books! All of them are super tame and have very younger-kid friendly height limits. Adults can ride them, too! This one is a tiny bit intense…it's a water ride that has some very real-looking dinos that pop out and snarl at you. You WILL get wet. Because we weren't able to get to each and every family-friendly option offered, you can go HERE to see more options. If you have a “travel” or “family fun” pin board, pin the image below! Looks like a fun trip. We were in Disney around the same time! First of all…water taxis…how fun! Also, great tip about measuring your kids ahead of time in the shoes they’ll be wearing so that you can plan accordingly ahead of time! So much fun, right? My boys were so upset that we didn’t go this year and area already asking about next year! Maybe we will see you! I hope so. It was great and I’d do it all over again in a blink. 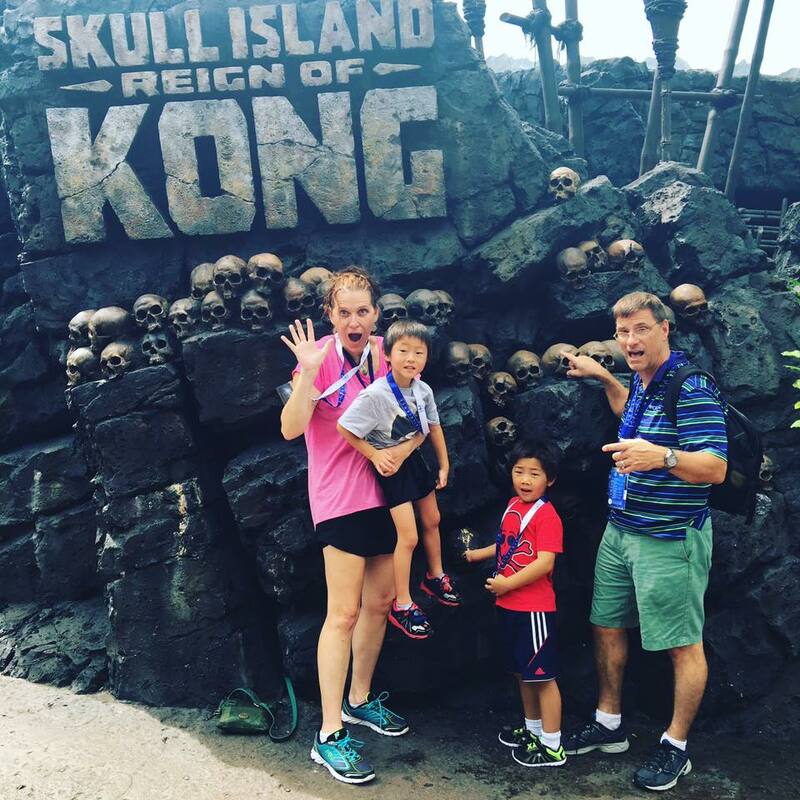 Wow I havent been to universal in FOREVER and I thought it was too much for my kids as well… but this post totally changes that! It would also be so nice to do something different than Disney & Epcot. Oh my gosh, looks so fun! I can use the same tips with teens. ha! They don’t nap either & stay up way to late. I really want to visit Florida some day. Fun, fun! Adding this to my travel board & bucket list. Theresa Huse recently posted…Pretty Fall Banner With Wood Letters Make This In No Time Flat! It sounds like y’all had a great time. I have been a few times, but it sounds like there is some new things to do there since I have been last. Great tips for planning with kids, thanks for sharing!